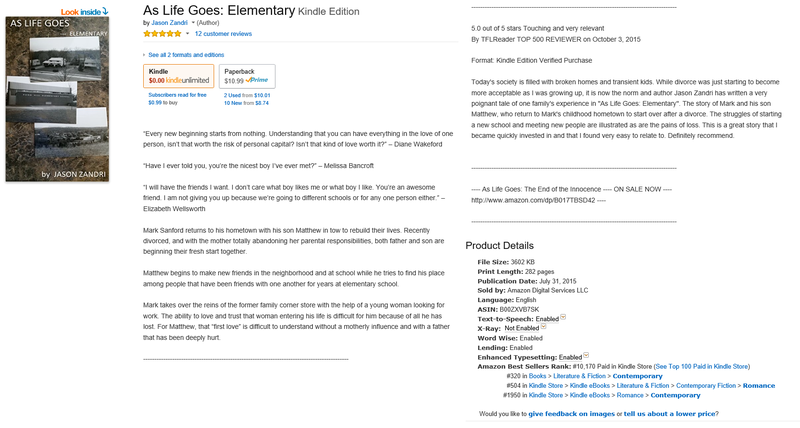 March 9, 2016 March 9, 2016 GUNDERSTONE "As Life Goes - Elementary", "As Life Goes: The End of the Innocence", "As Life Goes: The Reunion", Amazon Rank, As Life Goes: The Wedding, “As Life Goes: The Funeral"	"As Life Goes - Elementary", "As Life Goes: The End of the Innocence", "As Life Goes: The Reunion", Amazon Rank, As Life Goes: The Wedding, “As Life Goes: The Funeral"
With the presale release of As Life Goes: Elementary I had my first title in the Romance genre and category listing on Amazon. 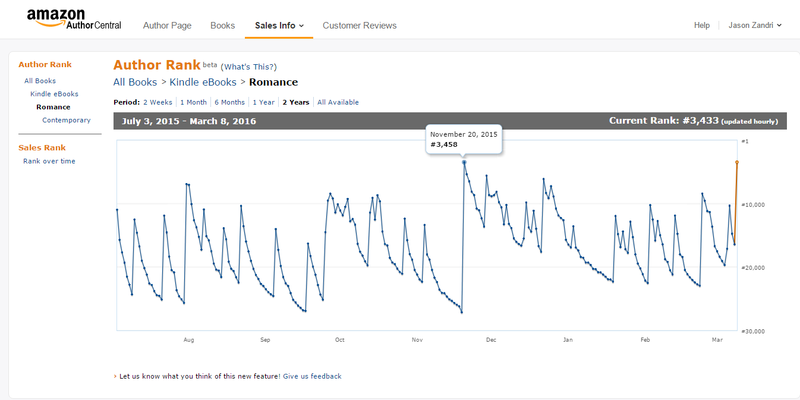 On November 02, 2015 I hit the highest level as an author at a rank of 3,458. Sales from yesterday and today squeaked me over, just a little, to 3,433, which allowed me to place just slightly higher and closer to #1. An inch or a mile – higher is higher and I’ll take it. As I outlined in my prior post, “”As Life Goes: Elementary” is at a three month high”, the title and the overall series itself is on a tear. My own promotion on Twitter and some super assistance from the #RaveReviewsBookClub gang is the bulk of the spotlight focus, that is for sure. If you’re an author and want to get some of that support, JOIN HERE and tell them Jason Zandri / GUNDERSTONE sent you. Even if you’re “only a reader” – the club is a great resource to introduce you to some great (currently) unknown indie author titles. I am looking forward to some great things with this series and I am planning to have book three “As Life Goes: The Reunion” released this summer (I am gunning for the one year anniversary date of book one – “As Life Goes: Elementary” which would be July 31, 2016). The further plan would be to release “As Life Goes: The Wedding” before the end of the year (November 27, 2015 was the release of book two “As Life Goes: The End of the Innocence” and presently that is the date I am targeting). I am planning book five, “As Life Goes: The Funeral”, the final book in the series, for Q1 of 2017. Thank you so much for following my Facebook author page and my fan page over at Amazon, and of course, this blog – these are the best resources for information on what I have going on and the release dates of my stories. Thank you for being a great fan and follower! With the planned release of “As Life Goes: The Reunion” slated for this summer, this pop up in the ranking is very encouraging. “As Life Goes: The End of the Innocence” has been doing decently on and off as well so I am looking forward to great things from this series.